It’s hard to imagine now, but eight years ago I was living a block away from one of the busiest freeway intersections in the Twin Cities and directly under an airport flight path. I was burnt out working odd jobs, and my dog’s hip problems had gotten so bad there was a euthanasia date marked on my calendar. I was a wreck. It was clear that something needed to change: so I drew a circle on the map and started to look for a place to rent within that hour’s drive. What I found was a quiet old farmhouse on one acre of land in rural Le Sueur County. There were foggy morning sunrises, gravel roads and a community of farmers. I felt something in me settle. I was home. The farmhouse I rented was owned by Jean and Dean Braatz who lived just across the way with their four children. 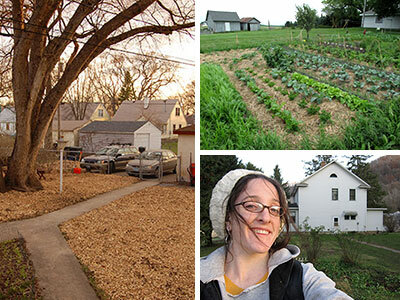 They were then just beginning what would become a successful CSA business and spent their workday and their free time in the soil — planting, weeding, irrigating, tilling — learning through trial and error, all the while with their children by their side. The farm was a business for the parents, a game for the kids, and a classroom for all. It was a thing of beauty to behold. I was inspired, to put it mildly. I planted and tended my first farm garden. I canned jams, made cider, froze garden veggies, and experimented with baked delicacies. I was healthy. I was active. I was more excited by my life than I had ever been in the city. And after two years of gardening, and of watching the Braatz farm and family grow, I began the search for a farm of my own. I had spent time in southeastern Minnesota as a girl, so I began watching for farms available in this familiar countryside. As luck would have it, my trips to bluff country brought me back in touch with Daniel, a friend from the past who soon became my future. We are now raising our son and realizing our own farm dreams in beautiful Houston County. I recently rediscovered an elementary school writing assignment I had stashed away: “A letter to our future selves.” And there, scrawled in my 12-year old handwriting, I had written, “When I grow up I want to be a farmer. I want to have lots of animals. My farm would have lots of trees and a big garden.” I am now 35 years old. And as I look out at my ¼ acre farm garden, and the beautiful wooded bluffs stretching up behind my house, I am smiling as I congratulate myself and my 12-year-old self, for getting ourselves to where we always wanted to be. Interested in joining a CSA this year? My Minnesota Farmer is the Braatz family’s CSA and they have pick-up sites all around the Twin Cities. I can identify completely ! Love your farm!